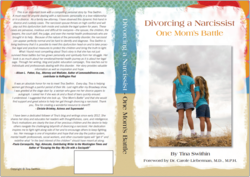 Author, Tina Swithin's new book, "Divorcing a Narcissist" officially hit the Barnes & Noble bookshelves in January and has generated a great deal of conversation in the media about Narcissistic Personality Disorder and how this disorder plays out in the Family Court System. "Divorcing a Narcissist: One Mom's Battle"
"Divorcing a Narcissist" has been in bookstores for one month and is receiving rave reviews from attorneys, doctors and celebrities. Her journey is eloquently laid out and her story is gripping. Tina Swithin’s new book, “Divorcing a Narcissist” has only been in bookstores for one month and has received rave reviews from attorneys, doctors and celebrities alike. Tina's journey is eloquently portrayed in this memoir and her story is gripping. Tina takes the reader through the typical “prince charming phase” during the courtship, through their troubled marriage and ultimately, into the dark trenches of her custody battle to protect her young daughters. Author, Tina Swithin is an inspiration to many around the world as her blog, “One Mom’s Battle” has gained international recognition over the past year. Tina has acted as her own attorney in a 4-year custody battle while maintaining her favorite roll as a full-time mother. Tina is also a Huffington Post contributor and is available for interviews, guest blogs, book signings or appearances. Excerpt from a recent book review by retired attorney and author, Sandra Shwayda Sanchez of Book Pleasures: "Praised by attorneys, doctors and celebrities, Divorcing a Narcissist, is an important book that took courage as well as insight to write. While she is not a psychiatrist or an attorney and points this out, she has applied her obviously considerable intelligence to a complex situation and these tips are grounded in that wisdom that only firsthand experience can impart. I highly recommend this book not only to women facing similar experiences but to young women who can benefit from those red flags before they fall into similar situations. I also recommend this book to attorneys, judges, GALs and social workers in the Family Court and Juvenile Court Systems." To read more, click here. Testimonial from Supermodel Christie Brinkley: "It was an absolute honor for me to meet Tina Swithin. Every day, Tina is helping women get through a painful period of their life. Last night after my Broadway show, I was greeted at the stage door by a woman who gave me her divorce papers to autograph. I asked her if she was okay and a flood of tears quickly ensued. I understood. I suggested that she look up, "One Mom s Battle" and that she would find support and great advice to help her get through divorcing a narcissist. Thank you, Tina for creating a wonderful resource to share!!!!" "This is an important book with a compelling personal story by Tina Swithin. A must-read for anyone dealing with a narcissistic personality in a love relationship or in a divorce. As a family law attorney, I have observed this dynamic first-hand in divorce and custody cases. The narcissist spouse thrives on high conflict and will play out this dysfunction both inside and outside the legal system for years. These cases are pervasive, insidious and difficult for everyone the spouse, the children, the lawyers, the court staff, the judge, and even the mental health professionals who are brought in to help. Because of the nature of the personality disorder, the narcissist can appear perfectly normal and be hard to identify and diagnose. Tina Swithin is living testimony that it is possible to meet this dysfunction head-on and to take proactive legal and practical measures to protect the children and bring the truth to light. What I found most compelling about Tina s story is that she has not just survived these battles but has grown personally and spiritually from her struggle. Her book is as much about her emotional/mental health journey as it is about her legal saga. Through her writing, blog and public education campaign, Tina reaches out to individuals and professionals dealing with this disorder. Her story provides valuable information as well as inspiration and hope."